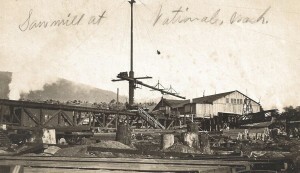 Two shots taken at the sawmill in National early in the 1900s. The shorts are more of a before and after. The first shot you can see the logs rolling into the water. The second you can see the finished lumber. Click on images to enlarge.Photos courtesy of Laurie Anderson Osborn. 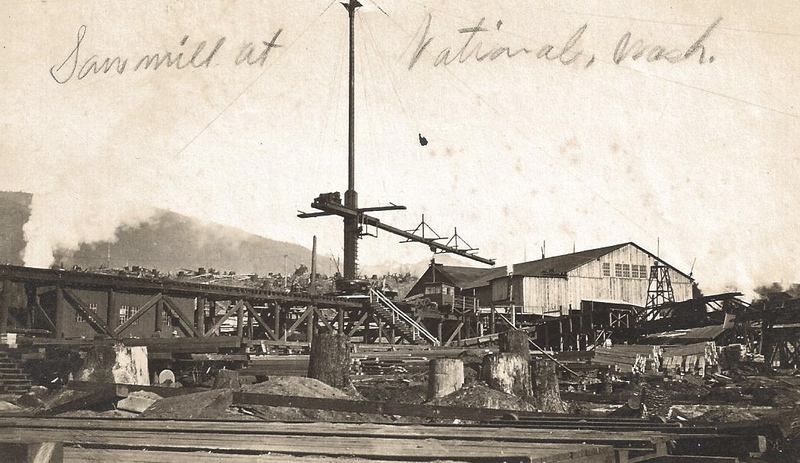 Love the pictures of the Pacific National Mill — My grandfather (Smith H. Miller), his brother (Lynn H. Miller) and their father, (J.C. Miller)were instrumental in starting the mill, in 1906, I believe. My mother was born at the mill in 1909. 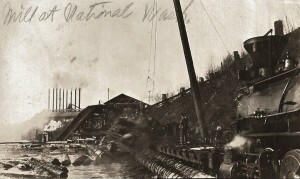 I have some pictures of the day the mill burned (1912) if interested in looking at them. I had loaned them to J. Clark McAbee and he used some of them in his wonderful book, Rails to Paradise. If there are any other pictures extant of the mill, I would love to see them, My line of Millers were associated with the mill until about 1918 ?? I would LOVE to take a look at the pictures . . . and post some if that’s OK. People really enjoy not only seeing those pictures, but also hearing the family stories that go with them. (My email is diane@spilledinkstudio.com and my phone is 360-832-1745.) I’ll check and see what other National pictures I have. I know there are some I haven’t posted yet. So, I’ll get them up there. I wrote about two years ago. Sorry I never did get back to you. Yes, the photos were published (first time ever) in McAbee’s wonderful book, Rails To Paradise. I do not know too much about the photographs, who took them, or where exactly they were. But be glad to send via email if still interested! Did I ever send the pictures of PNLC that I said I would? I honestly cannot recall. Maybe I couldn’t figure out how to attach the picts to the website here. Please let me know…..I Promise this time I will! 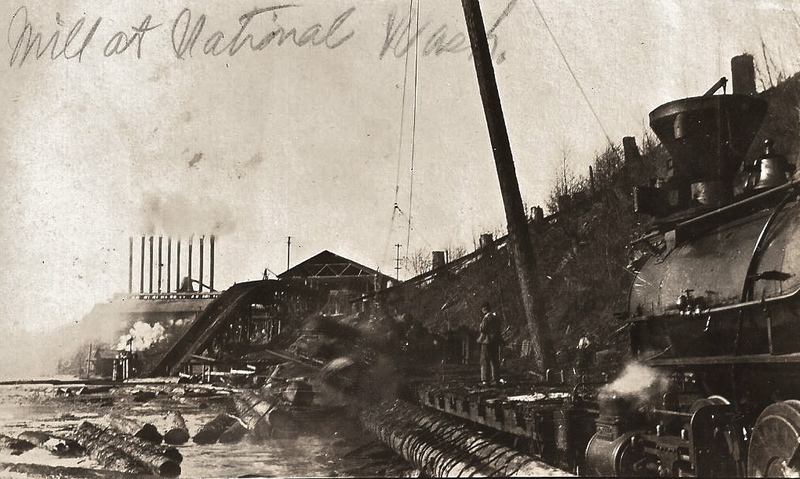 The first picture is the last load of logs dumped into the National Mill Pond. It was taken by my grandfather Lee Osborn and past on to me by my father Orville Osborn. Hi Again. Yes I will send. Will annotate with what I know.